Whilst physically that answer is correct, the record books suggest otherwise, 41241 hauled daily what in this day and age could be called a ‘ghost train’. That well known KWVR figure, David Pearson, has sent in this absolute gem of BR at work in the latter days of steam. In the National Archive is the correspondence sending her from Llandudno Junction to Skipton. It clearly states that she was sent to Skipton in 1964 to work the Worth Valley branch goods train. The branch had closed in 1961 and this was commented upon by an unknown hand at Euston, when sending the memo back to Crewe where the comment was added; “send in any case; will employ at least two men and use some coal”. Astonishingly, the move was made and at least one KWVR volunteer remembers her passing his school in Keighley as she arrived from Skipton more or less every day, light engine, about noon. On arrival she was parked in the Banana Siding alongside the long demolished goods shed, where she stayed for about three hours doing absolutely nothing, rather than work the branch goods, had it still been open and operated. She then went back to Skipton about 3.30 p.m. having done nothing at all. She did this utterly pointless exercise for at least two years, presumably employing at least two men and burning lots of coal; a remarkable comment on the objectives of a nationalised industry. We are grateful to David for passing on for a wider audience information that came to light some years ago, during research into the wider subject of locomotives that worked on the KWVR whilst part of the national network. You couldn’t make it up. 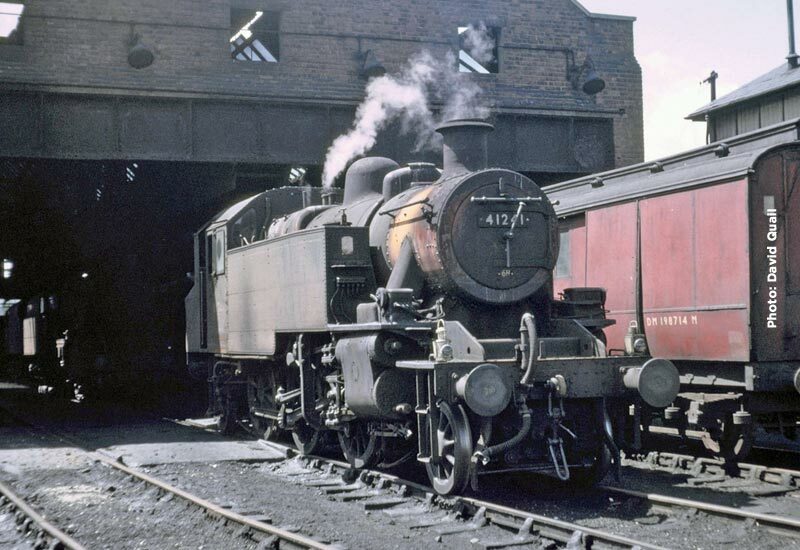 David Quail’s photograph taken on the 11th July 1966 shows 41241 in a woebegone state in steam at Skipton shed. Waiting to take the Worth Valley freight? We’ll never know. Fascinating stuff!!! Sounds like the worst excesses of a Soviet 5 Year Plan! Still good job it happened eh! *Finance Assistant* Keighley and Worth Valley Railway Ltd.